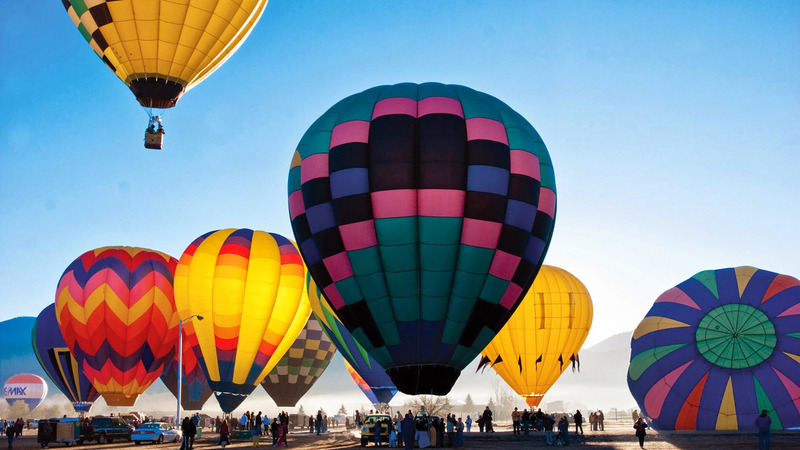 While Taos may be most widely known for its arts and culture, stunning ski slopes and exhilarating hiking, there’s another activity that is guaranteed to take your Taos vacation to (literally) another level: A picturesque hot air balloon ride. Taos hot air balloon rides follow a unique balloon flight path over and in the Rio Grande Gorge (baskets even touch the river! ), the wilderness and the “high bridge” — which is unmatched in its scenic beauty and top-notch hot air balloon flight conditions. Four-hour flights start around $200 per person and usually include a post-flight champagne toast and brunch. Traveling to Taos in fall? On Oct. 27-29, the Taos Mountain Balloon Rally will celebrate its 35th year. Each fall, Mother Nature paints the trees vivid shades of orange, red, amber and yellow — and even more color is added to the vista as the Taos skies are filled with dozens of brightly colored hot air balloons lifting into the Taos Mountain sunrise.The event hosts 35-50 balloons each year, and has become a popular stop for balloonists, families, crews, Taoseños and visitors alike. Click here to learn more! Because after all, why walk when you can fly?